The Church of Jesus Christ of Latter-day Saints has excommunicated a prominent backer of ordination of women priests, her advocacy group has said. 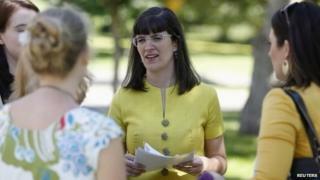 Kate Kelly, founder of Ordain Women, was notified of the ruling on Monday, a day after a trial by judges in the Mormon Church, Ordain Women said. The group said the Mormon Church hierarchy deemed her an apostate for her contravention of Church doctrine. The Utah-based Mormon religion boasts more than 15 million members worldwide. According to a letter informing her of her excommunication obtained by the Deseret News, a leading Utah newspaper, Ms Kelly will be barred from some acts of church worship for at least a year. "You are entitled to your views, but you are not entitled to promote them and proselyte others to them while remaining in full fellowship in the Church," wrote Bishop Mark Harrison of Virginia. She can be readmitted to the fold if she shows "true repentance", including ceasing "teachings and actions that undermine the Church, its leaders, and the doctrine of the priesthood", he wrote. Ms Kelly said the church's decision, taken by an all-male panel of judges, was "exceptionally painful". "Today is a tragic day for my family and me as we process the many ways this will impact us, both in this life and in the eternities," she said. The Mormon religion was founded in the US in the early 19th Century and claims more about 188,000 adherents in the UK. The religion is centred on Jesus Christ but departs significantly from the Orthodox, Catholic and Protestant Christianity. It holds its founder Joseph Smith as a prophet. Its members revere its central text the Book of Mormon, first published in 1830 in New York state, as holy scripture that complements the Bible. Church doctrine holds that only men can be ordained into the priesthood. Ordain Women, however, argue that the religion's tenets "support gender equality, including the ordination of women". Excommunication is the most serious punishment that can be handed down by a Church court, Ordain Women said. Matt Martinich, a Mormon who studies membership numbers for research group Cumorah Foundation, told the Associated Press that excommunication is rare in the Church, with only 10,000-20,000 people being ejected from the Church every year.